Whether you choose an embroidery hoop or a frame depends on what type of embroidery you are doing. A hoop is a set of two rings – either wood or plastic (sometimes metal, but metal is never the best option) – each ring fitting inside each other, holding the fabric taut while you stitch. The hoop usually has some hardware on it (a bolt for tightening) and is usually held in the hand. A frame is made of wood, and the embroidery fabric is stretched taut and pinned, tacked, or sewn in some way onto the frame. Frames are normally held on some kind of stand or propped on the edge of the table during stitching, unless they are small and light. There are several types of embroidery frames. 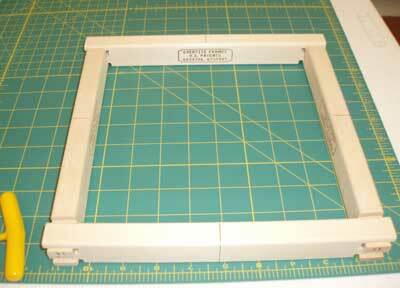 There are different types of embroidery frames: stretcher bar frames, slate frames, and scroll frames. Stretcher bar frames are generally fixed size frames sold in pairs. Two pairs make a full frame. They lock together with “dove tail” teeth on the corners, and then the fabric is tacked onto the resulting frame, using thumbtacks. Slate frames (pictured above) are made of two types of bars: side bars (or slats) that fit into roller bars (top and bottom of the frame). The slats have holes in them and allow you to adjust the up and down tension on the fabric, which is sewn onto the roller bars. The sides of the fabric are laced onto the side slats, so that you can tighten the lacing and therefore tighten the side to side tension on the fabric. Scroll frames are somewhat like slate frames, but they don’t allow for the top-to-bottom stretch that a slate frame allows, and the fabric isn’t usually laced on the sides. 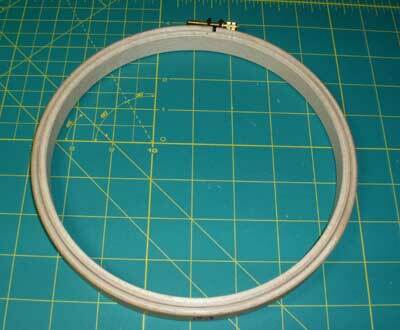 The embroidery hoop can be used for small and large surface embroidery projects. On small projects, it’s best if the hoop encircles the whole project design area. On large projects (such as table cloths and the like) worked in surface embroidery, the hoop is moved from place to place on the project. Often, to maintain maximum tautness and to minimize the risk of damaging embroidery and soiling fabric, an embroidery hoop is bound with twill tape and a protective layer of fabric, tissue paper, or even plastic wrap is mounted in the hoop over the embroidery ground fabric. Stretcher bar frames can only be used on projects that fit within the entire “frame” area of the stretcher bars. Why? Because the fabric is tacked onto the frame, and the holes made by the tacks mar the fabric. The tacks only go on the very edge, or waste area of the embroidery fabric. Slate frames can accommodate very large projects, as long as they fit the width of the roller bars. Any excess fabric, lengthwise, is rolled onto the roller bars as the project progresses. Advantages: 1. it can be help relatively comfortably in the hand; 2. it can be moved around on very large surface embroidery projects; 3. it is relatively inexpensive, even when purchasing a good hoop (when compared to some of the other frame options). Disadvantages: 1. ring marks, which can be removed from washable embroidery projects, but not from embroidery projects that can’t be washed (like goldwork or many types of silk embroidery or embroidery worked on fabrics like silk and velvet); 2. hoops can be uncomfortable to hold, especially for stitchers with arthritis; 3. hoops (especially poorly made hoops) can damage fabric; 4. hoops (especially poorly made hoops) do not always provide maximum tautness on the fabric. Advantages: 1. they maintains good tension; 2. they can be accommodated on many floor and table stands, which allows both hands to be free while stitching; 3. they are relatively inexpensive. 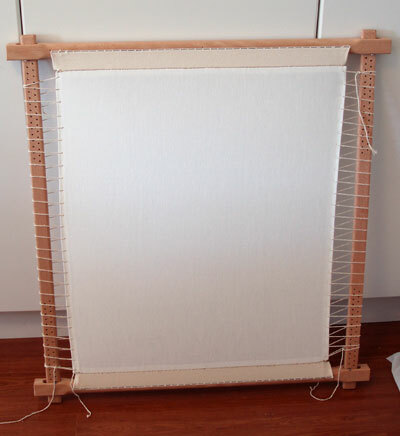 Disadvantage: once the fabric is mounted on the frame and tacked all around, it cannot be re-tensioned without removing tacks, re-stretching the fabric, and replacing the tacks. The exception to this is the Evertite stretcher bar frame, which allows for some tensioning even after the fabric is tacked all around on the frame. Advantages: 1. they can accommodate large pieces (or small); 2. they easily maintain the best tension on embroidery ground fabrics; 3. they leave both hands free for two-handed stitching. Disadvantages: 1. they are not widely available; 2. when they are available, they are expensive; 3. they can be large and bulky, so they normally require trestles to support them; 4. they take a long time to set up or “dress”, more so than any other hoop / frame option. Advantages: 1. They are fairly widely available; 2. They are relatively easy to set up; 3. They can accommodate a range of different sized projects, as long as the project fits within the width of the roller bars. Disadvantages: 1. Without lacing, they rarely maintain good tension from side-to-side all across the fabric; 2. They’re not usually made to accommodate lacing, as they have hardware in the middle of the side bars which can get in the way of lacing; 3. The rollers have a fixed location in relation to the side bars, so they are not adjustable from top to bottom. The top-to-bottom tension is maintained by how tightly the fabric is rolled, rather than by being able to easily move the rollers up and down on the side bars (like you can with a slate frame). These are my favorite hoops and frames, with more information on them in the links below. I want to second Mary’s comments about Hardwicke Manor hoops. I have every version of these hoops that I’ve been able to find. I have found them to be absolutely the best hoops for everything from surface embroidery to stumpwork to goldwork. I especially like my 6″ and 8″ 3/8″ thick hoops (thick hoops are wonderful). I don’t even wrap the inner hoop (I know you’re supposed to, but I don’t 🙂 because I can make my projects drum tight with a screwdriver. Earlier this year out of curiosity I bought a couple of Elbesee hoops from a British site because they appeared to be similar to Hardwickes and were quite a bit less expensive. I would not recommend the Elbesee hoops unless you have no other option. Although they are adequate, they are neither as sturdy nor as finished as Hardwicke hoops. I had to run steel wool over the Elbesee hoops in order to smooth them out. Hi, my favorite is a seat frame, it rest under your legs and both hands are free for embroidry. I like frames. Hoops are ok if I’m traveling really light but I don’t like fiddling and retightening all the time, or the uneven tension and crushing of putting them over worked areas. I also like a frame that’s big enough to sit on my knee and the arm of the chair so I can use both hands. Mary’s evertite frame sounds great, but I have got comfortable with a pin frame I made myself, and my assortment of scroll frames Pinning material onto the pin frame takes a while and I have to use pliers to get it to the right tension, and I actually think it’s easier to use a clip-on scroll frame and just lace the sides. Most projects fit on one oif my frames, or at most I have to move it once. I can do that in under 5 minutes,and that includes going and getting the box with the lacing yarn and putting it away afterward. 1) I’m planning a project that is going to be worked on a piece of fabric that’s about 2 1/2 to 3 inches wide. I’d really like to avoid the cons of hooping if I can help it, but I’m kind of stumped. The only think I can think of is to do the embroidery first, and then cut and finish the fabric. 2) To that end, what are your thoughts on the Q-Snap frames? I think they’re mostly meant for quilting, but do you think that they could be used for embroidery as well? I’d love to know your thoughts on both of these topics, the first especially. I’m going to be making a tallit, or a Jewish prayer shawl, and the piece in question, called the atarah, traditionally has the blessing for donning the tallit embroidered onto it. I’d really like to get started soon, so that I can have a tallit ready for Rosh Hashanah in the fall, so I’d really like to know your thoughts! On #1 – yes, I’d do the embroidery first and then cut the fabric. That’s the standard approach with any kind of garment-type construction from scratch. On #2 – Not a huge fan of q-snaps myself (they don’t grip most embroidery fabric well enough to keep it really taut, without some extra padding, and even with extra padding (i.e. felt strips), it still eventually slips. Just my take! If you work the embroidery on the fabric first, would it be possible to put the whole piece of fabric in a scroll frame or something of that sort? A slate frame? How wide is it? Yay! Thank you, that actually solves one dilemma I had. And too bad about the Q-Snaps, I actually thought they were a pretty cool idea, but I will bow to your superior experience and save them for when I finally do my first quilt. I’m planning on the finished embroidered piece– called the atarah (ah-TAR-rah)– to be about 30in long from end to end, and 4in wide, possibly 5in. If I find a frame big enough (and easy enough to manipulate– I don’t have the time or the experience to wrestle with a slate frame), I miiiight be able to fit the whole thing, but that’s where my knowledge ends. A scroll frame might be the best solution, but in order to fit the whole thing, I might end up having to turn it on its side to accommodate the length. Any suggestions? Also, I don’t know how relevant this would be, but the material I’m planning to use is most likely to be a cotton mix, since it’s not kosher to mix linen and wool, and the religiously required parts are made of wool. PS: I think I got my dimensions mixed up– width from left to right is going to be 30in, and length from top to bottom is going to be 4 or 5in. Also, I was reading your review of the Millennium frame, and I think I found my frame solution– but I’d need to take out a loan from the First National Bank of Grandma first, because hot DANG that thing is pricey! Add in the stand, and that’s half my month’s rent right there!